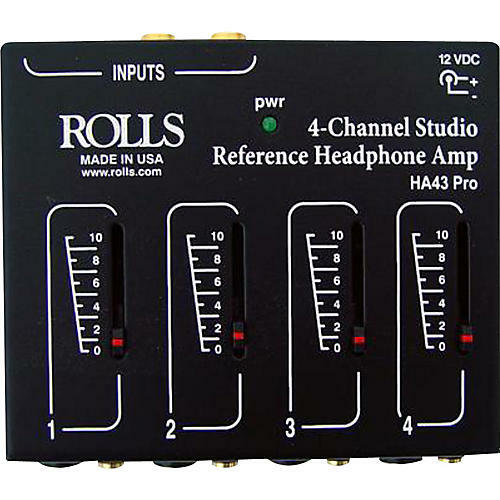 The HA43 Pro is a full-frequency response four-channel headphone monitoring device designed for the recording studio, or other professional applications like listening rooms and monitoring stations. Each output boasts a whopping 20dB of clean channel gain.The rugged 4" Rolls HA43 Pro Stereo Headphone Amp powers up to 4 pairs of stereo headphones. Features 1/4" jacks in and out; volume controls for all 4 channels; 10Hz-30kHz response for clear, accurate sound; vinyl-laminated steel chassis. Includes AC adapter. Dimensions (WxHxD): 4.15" x 3.45" x 1.16"